Sancocho is a hearty soup made with meats and vegetables, in a broth usually flavored with herbs (cilantro or parsley), combined with achiote, garlic, onion, scallions and bell peppers. 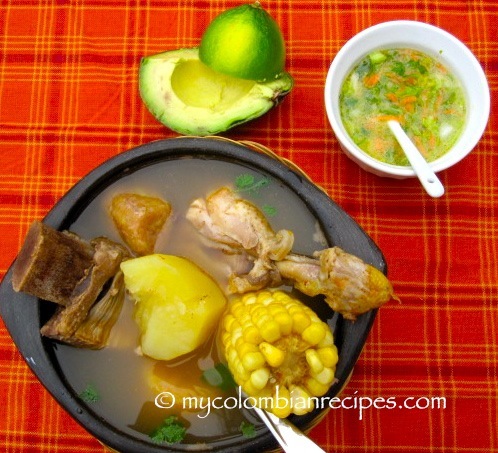 There are many variations of Sancocho, dependent on the region of Colombia. 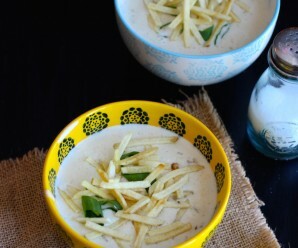 This dish warms the soul, heart and body, and is exactly what I expect to taste when I am craving a tasty, comforting, hot soup. 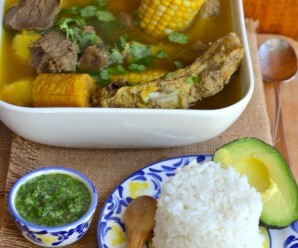 This is no Monday night, throw-together dinner, Sancocho is an event in a bowl! In some Colombian homes, this is the typical Sunday meal, perfect for enjoying with your family. 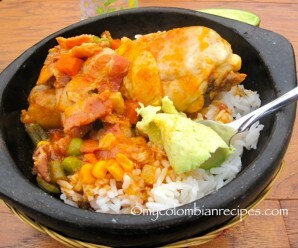 Some variations of Colombian Sancochos include, chicken, fish, beef, oxtail, pork and ribs, amongst others. 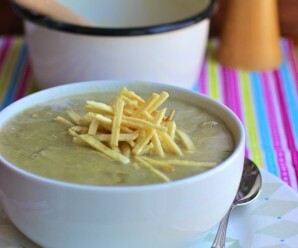 The recipe I am sharing with you today is Sancocho Costeño (Atlantic Coast Sancocho). Serve it with white rice, aji, avocado and lime on the side. 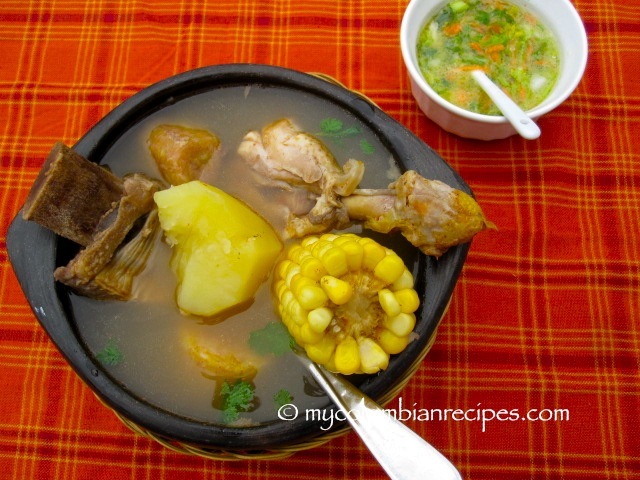 In a large pot, place the beef ribs,pork ribs, chicken, corn, aliños, chicken bouillon, salt and green plantain. Add the water and bring to a boil, then cover and reduce heat to medium and cook for about 45 minutes. 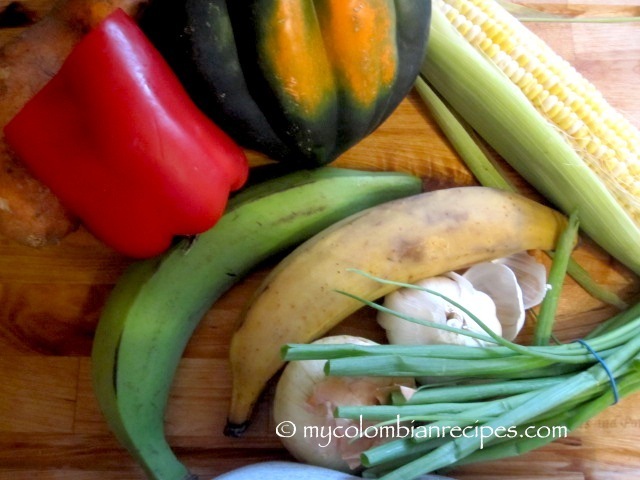 Add the potatoes, ripe plantain, yuca, pumpkin and cabbage. Continue cooking for 30 more minutes or until the vegetables are fork tender. Stir in the cilantro. Taste and adjust the seasoning. Serve in large soup bowls, dividing the chicken and vegetables evenly. Chock full of goodies!! Throw in that cilantro!! Wow that is the hardiest soup I have ever seen. You serve it on a plate after lol. It looks awesome and the options are infinite. I do love the cilantro too. Beautiful dish Erica…very comforting and so tasty. I love sancocho!! I’ve used bags of all the root vegetables in the frozen section and it makes it so much easier. 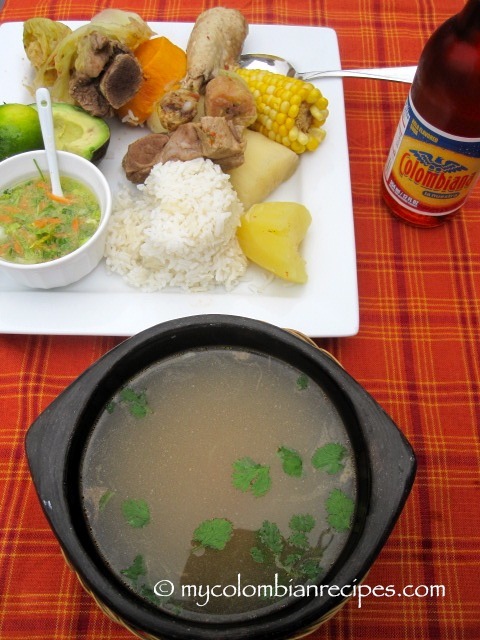 Your sancocho is great but I just looked at the Colombiana…it has been ages since I had a bottle….